Captain Mike Lynch picked up Player of the Season at for Leighton Buzzard’s end of season presentations. The skipper picked up the top prize for his leadership skills on and off the field as Leighton avoided relegation from Midlands 1 East. Colts George Burr and George Pratt Players Player of the season and Coaches’ Player of the season respectively. Jacob Murtagh 18 year old forward, secured the young player of the year award after a wonderful first senior season that also saw East Midlands U20 representative honours. 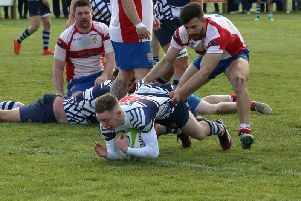 James Brett , 18 year old scrum half, secured the supporters player of the year (sponsored by Anytime Fitness) after an equally wonderful first senior season that also saw him achieve East Midlands U20 representative honours. Arran Perry one of Buzzards outstanding backs won The Jack Brown Cup for most tries scored. Jack Whitehouse, who had a terrific season in an unfamiliar fly half position, was awarded The First XV player’s player of the season. Nick Geoghegan, for excellent performances throughout the season, gained The Second XV players’ player of the season. Stuart Trotter and Ryan Andrew, were jointly awarded The Ben Walker Third XV trophy for their great work in getting teams together for fixtures. Club photographer, fixture secretary and match day programme editor, Steve Draper, secured a well-deserved England Rugby Mitsubishi Volunteer Award for his services to the club. Finally, Club President, Mark Hardy, was also awarded the England Rugby Mitsubishi Volunteer Award for his tireless work on behalf of the club.